Description A client has hired you to investigate and find four paintings he left behind in his old home after fleeing due to fears of it being haunted. This is my entry for the 2015 Halloween contest, I originally conceived the idea a while back when I was walking down my street and saw a house that looks similar to the one the player enters so I decided to take a mental note and I would use it later. When this contest popped up I thought it would be a fantastic idea to take a break from my other projects to work on this, because I knew it was going to be small I tried to make the mission challenging in other areas. I never thought I would make a creepy/horror style map but here I am, it was a lot of fun and hopefully you all get some enjoyment out of it too! Edited by Goldwell, 24 April 2016 - 03:34 AM. Edited by Oldjim, 31 October 2015 - 04:23 AM. Nice lighting improvements verses the beta! and then I hid on the bed. When the skeletons were strategically open, with a scant hair of health I sprinted between them downstairs and out the door! Needless to say I had a pretty bad stealth score. Unless I'm mistaken, no additional loot was added? Wow that sounds like a daring escape and pretty cool. You are correct in that no additional loot was added! *Big thumbs up for the briefing. That was really nice touch, and pulled me in to the mission. *Storywise I would have liked to find some clues or hints why the house was haunted. Why the skeletons appeared, what was the dining hall head-thing? What is going on? What do they want? That sort of thing. Not everything need to be explained, of course, but some horrific evidence is always nice. Preferrably spoon fed in small doses to keep the interest/anticipation level high. *The doors moved somehow smoother/realistically than I've accustomed to. What wizardry is this? *The water trap was nice, but wasn't particularily scary. It looked such an obvious trap, it built up tension and I did hesitate a bit before getting the key. Again, some kind of hint why the house wants the player dead would have been nice. Gameplay: Average. 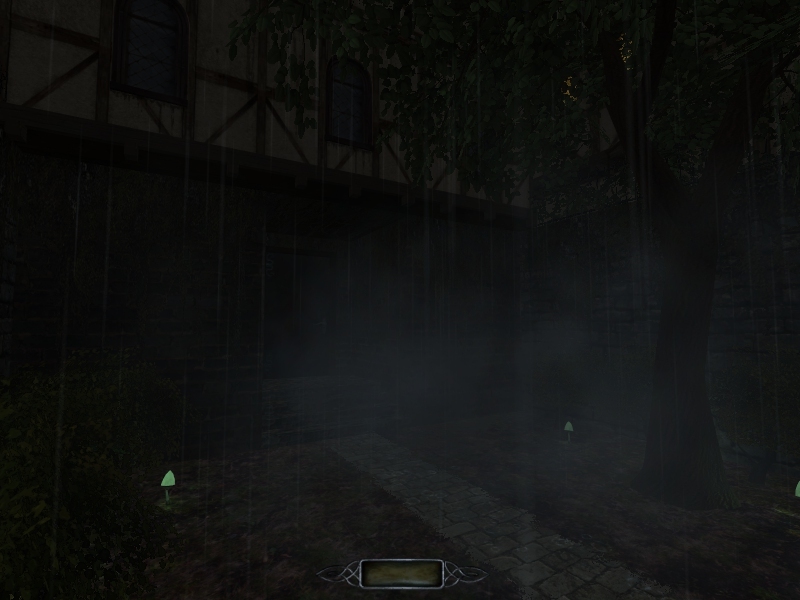 The mission is pretty basic in terms of gameplay. Dodging the skeletons was pretty straightforward and I had to even revisit the kitchen because I missed the painting the first time around. The spider was more of an irritation than horror and I missed my pest-control tools: sword/arrows. Halloween: Average. With the briefing and the starting scene my expectations were quite high. Then as the mission progressed I felt it sort-of fell flat because there were no clues or plot devices keeping me mesmerized. By the time of the spider all the dreadful anticipation was already gone. But still, it was a good 20min of sneaking fun. Thanks for the mission, Goldwell! Really fun little halloween mission. The briefing is awesome, narration and visuals work really well. I know its supposed to be a cheesy horror holiday, so Im not asking for deep psychological stuff, but after such a intro where a simple mission is layed out (grab some paintings), and we hear how the thief character doesnt really believe in the supernatural (to the point of not carrying any weapons on him ), it seems hard to believe any sane man would STILL go at it after witnessing the horror show in that dining room, or having the house try to murder him by drowning. You forgot to a) seal the entrance in a way that would force us to go through the place anyway because we have to, and b - make it a survival run after we realise this haunted house thing is for real so you just forget about the mission loot and get objectives on where to go and how to make it out hehe. Joking. I really liked the outside area and the rain. The first floor had the most interesting architecture and texturing for me. After some scares here and there I was half expecting basicly every room to contain something bad, but it was actually pretty peaceful for the most part. The attic specially was a good set up for a scare (see The Creeps). The spider was indeed hard to sneak by, with its random walking around. But maybe because of the lack of polstergeist kind of moments, or because the place was so damn well lit (it could have been way way darker IMO), I wasnt as scared as I would have liked to be. Still, a pretty fun mission with lots of good ideas and very able execution. The mood that is set up in the ground floor keeps you tense throughout, on your toes. The house is tight, with enough character on each space to make it interesting. It seems like the house is inhabited by hellish beings that are decorating it to their liking (or the house's, who knows). Thanks for this, amazing what you can do in so little time! Edited by RPGista, 31 October 2015 - 09:08 PM. It did turn out to be a picture hunt - which is what one would have expected - but if one failed to get the picture on the ground floor before the ghouls appeared it became far too difficult to complete because of the restricted space and the paths. A classic Halloween mission with the expected scary things inside but a bit linear and somewhat feeling empty gameplay-wise. The intro was overkill for such a short mission and work would have been better invested into making the furniture look as rotten as the house itself. But it added to the mood and almost made me vote a point higher for "appearance". The gameplay really missed some moar plot details and exploration. The mentioned journal would have helped. Less linearity too. The option to kill that spider or better shadows would have spared me some reloading. Also there was nothing to loot except the paintings. And i dont mind starting lightweight. But then i expect to find some tools while exploring. Would not be that odd to find a sword in the room with the head on a plate for example. I can't remember the exact name of the spawnarg but if you open up my map you can check the doors and see. This is pretty much the kind of mission in size and scope that I expected from the contest! Thanks! The briefing is very professional, and way above the call of duty. It makes this simple and short mission seem larger than it is. Visually, the place looks good, although it does not live up to the initial impression of the small, rainy side garden. 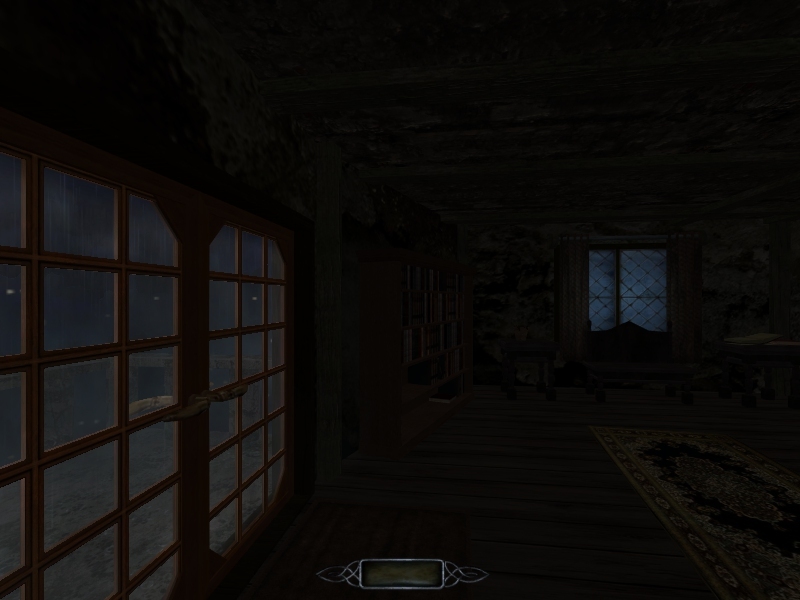 The house interior has a relatively high ambient light level, but few light sources. This makes things look slightly washed out and even. 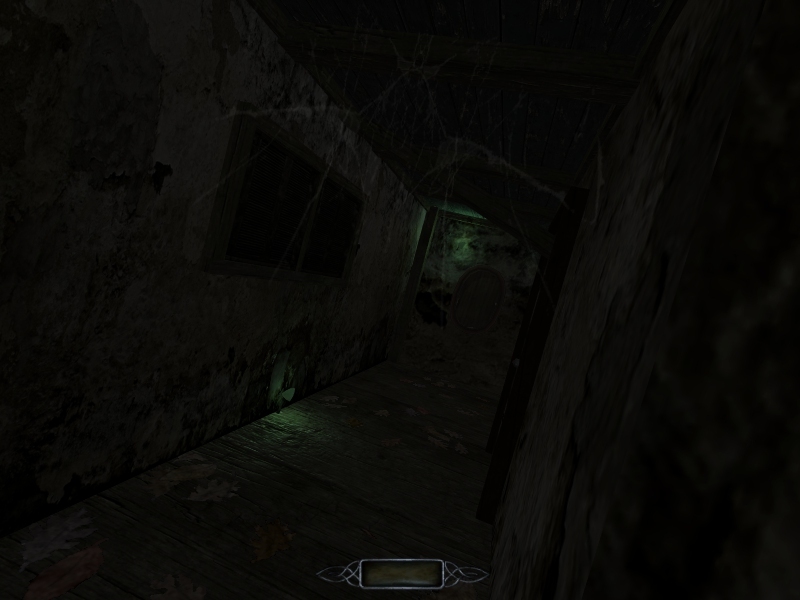 More lights and a lower ambient would have created better contrasts; the rooms which do have lights in them (like the spider lair) look better as a consequence. The gameplay is exploration with a few surprises (that you could often see coming, although the most effective one might be the things you expect coming, but never arrive). It is fun to sneak through the house, although, as has been noted, the tight corridors make the final escape harder than necessary - a few niches could have helped here. Edited by Oldjim, 03 November 2015 - 06:09 AM. The random skeleton flashing and howling in the stairs nearly knocked me out of my chair lol. Considering the tiny build time I really can't criticize anything about the mission, was a solid job well done! Edited by Bienie, 03 November 2015 - 10:37 AM. This contest entry felt to me like one of the b/w Universal horror films from the 1930s ... for whatever reasons. Probably for it has the "classic" ingredients of a fine Halloween mission. Which I enjoyed. Thanks Goldwell! Even though I guess it was fairly simple overall, I just really like the atmosphere of the place. Those slightly strangely laid-out old houses with that peeling paint and unsettling feel just do it for me. I screamed like a little girl at the flaming zombie apparition. I thought the floating key was really cool looking with the shadow it casts. Great use of light for a surreal creepy effect. I was tense the whole way through, always expecting the unexpected. Thought the opening sequence was excellent! The only thing, maybe it should have been Autumn Cleaning, considering the season & all the leaves on the floor. If you are not already hired for doing the intros of the TDM campaign, you should ask if you could do the job. This is another FM from you with a great introduction, really enjoyed it. I appreciate all the comments about the briefing video! I made the briefing videos for all of his previous entries, and really enjoy making them. It's the kind of work I've always wanted to do! This one I made very quickly on short notice for his Halloween entry, despite all my heavy work going on. I'm glad you all enjoy it! I've offered my help to the Dark Mod Campaign, but it appears they don't need my help with the one they're making. Outside of the next video I'm working on with Goldwell, I'll have a lot of free time this month and would love to make more videos. If you guys need anything don't be afraid to drop me a PM as I love working with this community! Thanks for that mission, I enjoyed it. Reminded me of a T2 fm I played years ago called deceptive perception. bad was going to happen, had to actually work up a little courage. Edited by sittingduck71, 09 November 2015 - 01:07 AM. Some very atmospheric stuff here and there! Some kind of bland stuff as well, but that's to be expected considering the time constraints. Seing the huge shadow of the little key floating in the distance was a particularily cool touch. Not a whole lot of stuff to do, and the patrol patterns of the AI:s felt wonky. An antagonist suddenly and unintuitively changing direction and discovering you due to pathfinding issues is one of my pet peeves. Having to pick the lock while the basement floods was a really cool idea though. Jumpscares, spiders and skellingtons, oh my! None of which do anything for me personally, but I'm highly desensitized to horror. It has to be said, anything that makes Fen scream like a girl is always something to be applauded. Also, having "pant pant pant, I WILL FIND YOU" playing on infinite repeat just reminded me of a third rate haunted house attraction*. Would work MUCH better as a one shot. *I was expecting a papier maché ghoul to spring out at any moment. Some nice groundwork there, given the short construction time. Would love to see you expand on this once the competition is over.